In the interest of consumer protection and public education Rudra Center presents these pictures of Counterfeit rudraksha beads that have been purchased in the past and kept. These beads are sold in large quantities in India and outside by unscrupulous people taking advantage of the craze of the customers to procure them . The typical price at which they are sold ranges from $100 to $50,000. 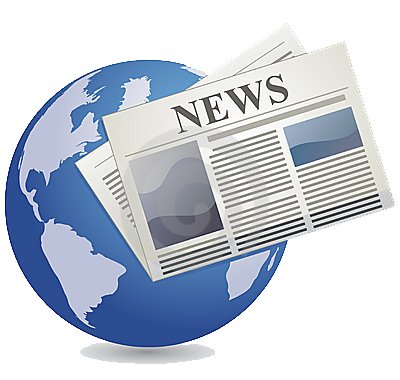 Rudra Centre does not trade in round one mukhis as they are not available at all . Even if you buy them for several 1000 dollars or from any ashrams or any reliable person , it would not be genuine as it has never been produced till date by any Tree in Nepal or Indonesia. 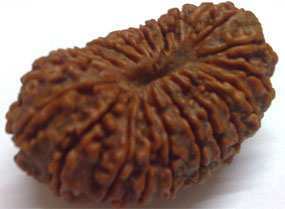 It advices the people to not go in search for this Rudraksha , just because it is rare. Half moon 1 mukhi is available easily as a low cost substitute . Hence it is sold at low price from Rudra Centre although there are people who sell this same bead for price as much as $1100 . For 1 mukhi round enquiries , we sell 1 mukhi from Java which exhibits similar properties as glorified for One mukhi in Puranas. 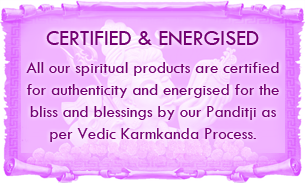 Rudra Center offers a free Authentication Service where there might be reasonable doubt regarding authenticity for any Rudraksha Beads purchased anywhere in the world. 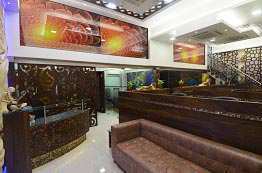 For this service the client pays shipping both ways to Rudra Center. 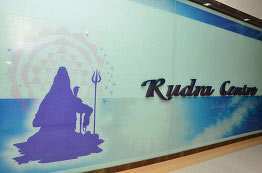 Another method of Authentication can take place by scanning Beads at high resolution and sending scanned pictures to Rudra Centre, India by email at rudracentre@gmail.com with subject line â€œ Authentication required â€œ. This is 2 mukhi flat bead from South India available abundantly. The line at one end is left as it is and the other line is manually altered to carve a lingam, Nag and trishul. This is the most commonly sold fake one mukhi. 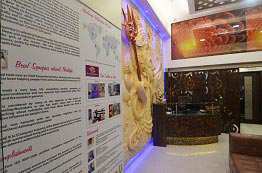 Fake One mukhis from Nepal with "Om" , "Trishul" & "Shivling" carved on the top. These beads are sold in the market at Rs 2 lacs. 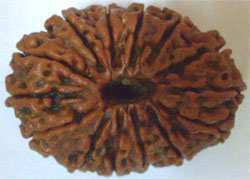 Fake 1 mukhi made by distortion of four lines in a five mukhi rudraksha . 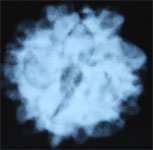 The x-ray shows that it is a 5 face rudraksha. Fake 24 mukhi carved out of Betel nut, plaster and paint. Notice the clean central hole and uniform lines which reveals its fake nature. 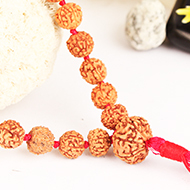 Fake bead made by joining together different sections of other rudraksha bead, to form one bead. 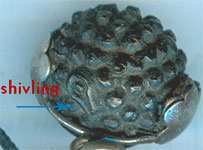 Notice the central round small hole and the sharp mukhi lines, which clearly reveal it as fake. Sold as 21 mukhi. Fake bead made by gluing together sections of several genuine rudraksha beads of lower mukhis. Sold as 14 mukhi in Kathmandu city of Nepal. Fake beads made by gluing together sections of several genuine rudraksha beads of lower mukhis. 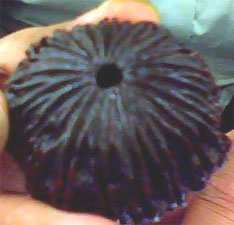 Sold as 21 mukhi in Kathmandu city of Nepal. Most commonly sold variety. This is actually a 3 faced Oval bead of Indian origin and not Nepalese . Other lines are skillfully obliterated leaving only one line. Purchased from Haridwar for Rs 1100- Rs 3000. 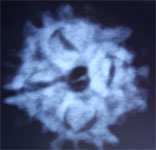 Can be identified by sight. Â Fake 1 mukhi half moon shape from China. It is commonly sold in market and dissolves on wearing and melts near heat. Surface is hard and not woody. 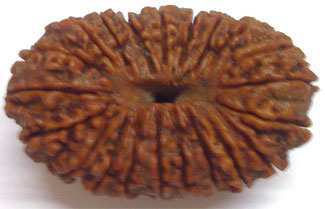 This is a seed with a skillfully carved line sold as a Rudraksha species bead . 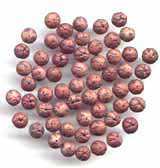 Can be detected by sight due to the presence of smooth scales on the bead which is unlike the thorny protrusions on rudraksha beads . 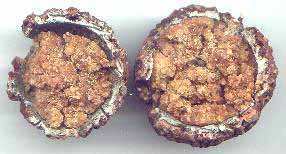 Usually sold capped in gold or silver to avoid seeing the drilled hole of the seed. Studies are going on to determine the species of this bead . Purchased from a reputed ashram for Rs 11,500. A commonly sold variety from Indonesia. 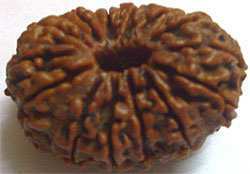 In this small pieces of Rudraksha are glued on four of the lines of a five mukhi bead thus leaving only one deep line. Can be detected by dipping in hot water for 2-3 hours . The other hidden lines would show up in a different color as the glue softens. Pieces chip off on regular wearing . Purchased from Indonesia for $100. Another very commonly sold variety . This is a giant ball like piece usually given a strong sandalwood odour. 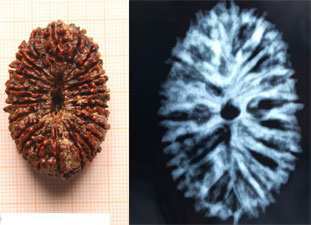 Small pieces of Rudraksha are glued on a seed and a line is carved externally. Sent by a client John chew of Singapore for verification purposes, which was purchased by him for $500 from a Himalayan monk. Has a natural stem implanted on top to give the "look". 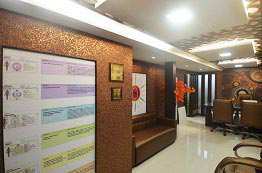 Pictures shows the outside view and the inner section after opening it. Filled with edible gum. This is a five faced Rudraksha bead in which all lines except one are hidden by sticking black glue. Pictures show two different views. Sold widely in India at road side hawkers in religious places.Â Can be detected by boiling in water and also by sight. This has Om , Trishul and Snake head carved and glued on two mukhi Bhadraksha beads . Sold commonly as 1 mukhi all over India and abroad . Purchased from Shop outside Trayambekhwar Shrine in India for Rs 20. Pictures show two different designs having 1 hood and 3 hoods. Fake beads made by carving extra lines. Typically 6,7 mukhis are changed to 8-12 mukhis with this process. Or 12 mukhis are changed to 14 mukhis and more with this. 7 mukhi changed to 8 mukhi by carving 1 line. 6 mukhi changed to 8 mukhi by carving 3 extra lines. Notice the sharp carved line. Fake mala of 108 + 1, 2 mukhi beads. Purchased in 1999, Indonesia. 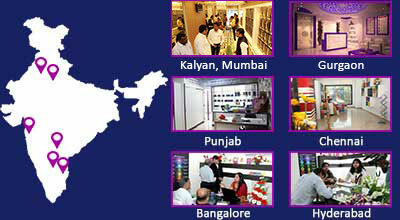 Now widely sold all over India. 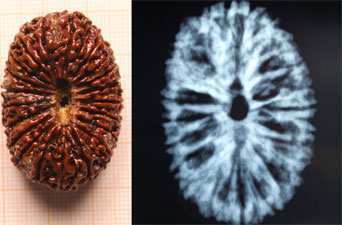 Seeds of Ber tree which are coloured and sold as rudraksha beads mala Can be detected by sight as no mukhis are visible. Fake mala of 108 + 1 mukhiless beads Purchased in 1988, Nepal. Fake beads carved out of betel nut. Method commonly used to make high mukhi beads upto 21 mukhi. Purchased in 1998, Varanasi, India. 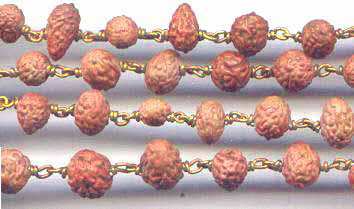 Fake Trijuti made from three Rudraksha beads ground and glued together. Purchased from Mumbai, India 1999. Fake Gauri Shankars made from two Rudraksha beads ground and glued together. Purchased from Mumbai , India 1999 and Nasik in 2001. 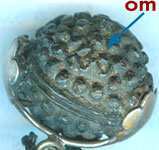 Under Developed 1 Mukhi Rudraksha showing clear One Mukh. Under Developed 4 Mukhs and 1 complete Mukh can be seen. 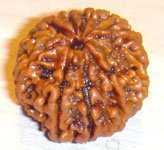 Under Developed 1 Mukhi Rudraksha showing clear One Mukh. Picture showing starting of Mukhs with 1 clear Mukh of under developed bead. 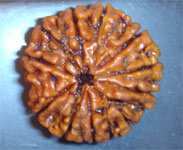 Under Developed 1 Mukhi Rudraksha showing clear One mukh. Picture showing starting of mukh of under developed bead. 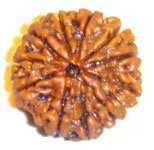 Under developed 1 Mukhi Rudraksha showing clear One mukh. Under developed 2 Mukhs and 1 complete mukh can be seen.